28 November 2017. The Journal of Experimental Marine Biology and Ecology just published the latest study by our group looking at differences in the CO2 sensitivity of Atlantic silverside offspring stemming from different mothers. Congratulations to Jacob Snyder for his first peer-reviewed publication. Offspring produced by different females varied in their sensitivity to high CO2 conditions. Specific fatty acids in eggs were correlated to the log-transformed CO2 response ratio of embryo survival and hatch length. Maternal provisioning might be an additional determinant of CO2 sensitivity in fish early life stages. Potential for maternal effects on offspring CO2 sensitivities in the Atlantic silverside (Menidia menidia). M. menidia. 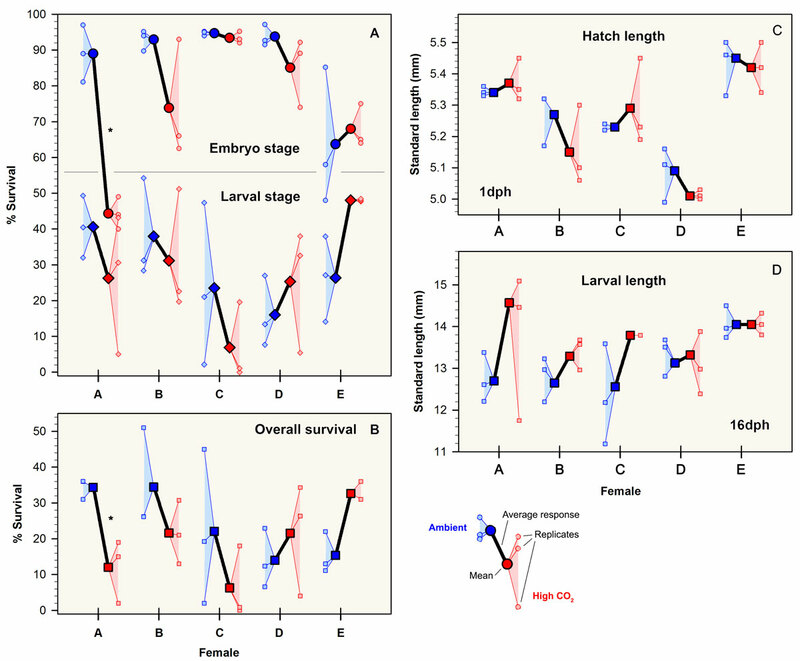 Responses to high CO2 conditions among replicates within and among females: (A) embryo and larval survival; (B) overall survival; (C) SL at hatch; and (D) final SL (16 dph). Patterns of larval growth were nearly identical to panel D and are therefore omitted. Ambient and high CO2 treatments are denoted by red and blue colors, respectively. Small symbols depict replicate survival (A,B) or replicate average size (C,D), while large symbols depict CO2 treatment averages for each female. Black lines connect average response for each female. 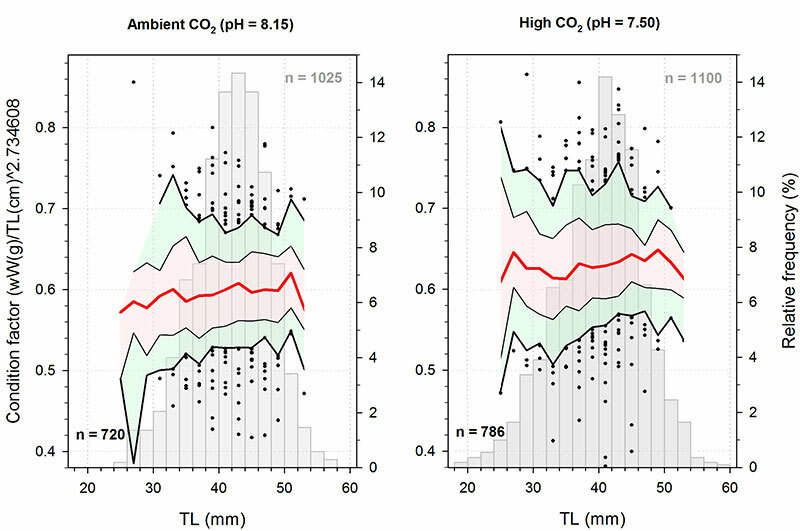 Asterisks represent significant differences (P < 0.05) between CO2 levels within offspring of each female (Bonferroni adjusted t-test). Letters denote to females A to E.
October 10th 2016 was a special day for our still young lab here at the University of Connecticut, Today, the ICES Journal of Marine Science published the paper of Chris Murray et al., which is the first of hopefully many publications of our experimental findings originating out of our new laboratory facility here at UConn Avery Point. Chris and his co-authors report on a large-scale, quantitative rearing experiment on Atlantic silversides eggs, larvae and juveniles under contrasting CO2 conditions that took place between May – September 2015. This novel experiment was designed to address three critical issues lacking in previous ocean acidification research on fish. First, the study spanned several ontogenetic stages. Second, it used very large numbers of individuals to robustly characterize not just potential shifts in mean responses, but also changes in the distribution of length, weight, and condition factor. Third, it provided food at standardized, non-excess levels to prevent that potential metabolic costs of high CO2 exposure could be compensated by survivors simply by eating more food. Overall the study demonstrated seemingly small but significant growth reductions due to high CO2 and identified a small number of fatty acids that were of significantly different concentrations in high vs. control juveniles. 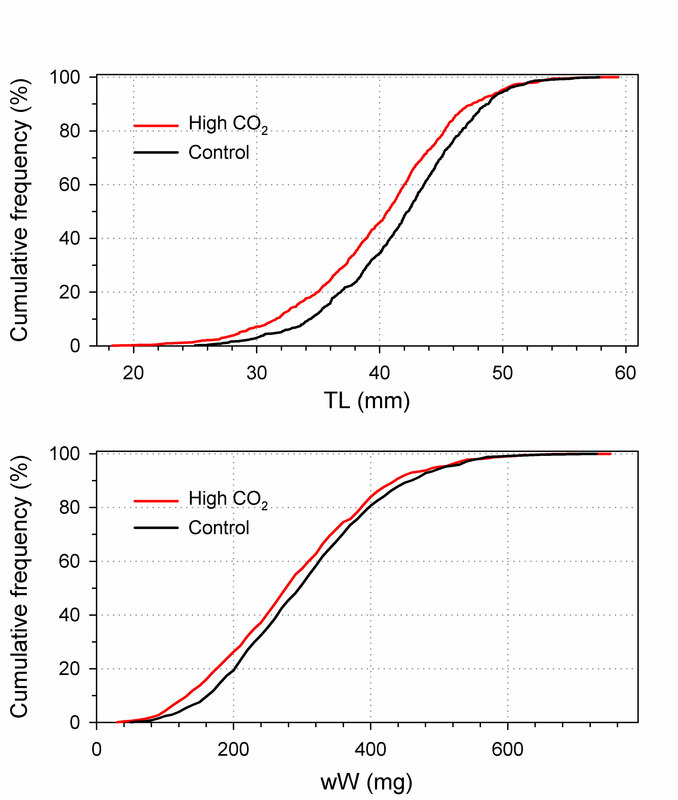 Distributions of condition factor per 2mm TL interval for juvenile M.menidia reared for 122dph at control (a) and high CO2 conditions (b). Thick and thin black lines correspond to the 10th/90th and 25th/75th percentiles, respectively, while the red line depicts the median. Data below the 10th and above the 90th percentiles are depicted by black dots. Underlying grey bars show relative frequencies for each 2 mm TL class. Black and grey numbers correspond to numbers of individuals measured for both TL and wW, or for TL only, respectively. Cumulative frequency distributions of (a) total length (TL) and (b) wet weight (wW), in juvenile M. menidia reared for 122 dph at control and high CO2 conditions. Consequences of elevated CO2 exposure across multiple life stages in a coastal forage fish.